Well, this past weekend was the Sewing Expo! 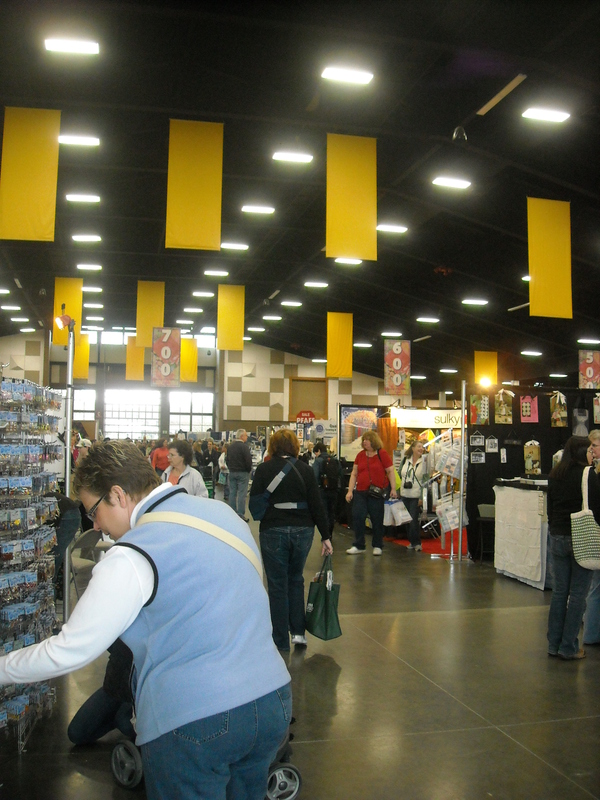 I didn’t know this until I started going back in 2008 (and I’ve been going back every year since), but the Sew Expo is the largest sewing show in the country. Anyways, I was fortunate enough to go twice this year, both on Thursday as part of my internship and then on Saturday for fun. Not that going to a sewing show as part of your internship isn’t fun, of course (it totally was, btw). Even though every year the show seems to be geared more and more towards quilters, I always have a fabulous time and this year was no exception. The only real bummer was that the class I was going to take on getting a perfect vintage fit with Gertie from Gertie’s New Blog for Better Sewing was cancelled. So, instead, mom and I took a class on starting a sewing business, taught by Martha Pullen. 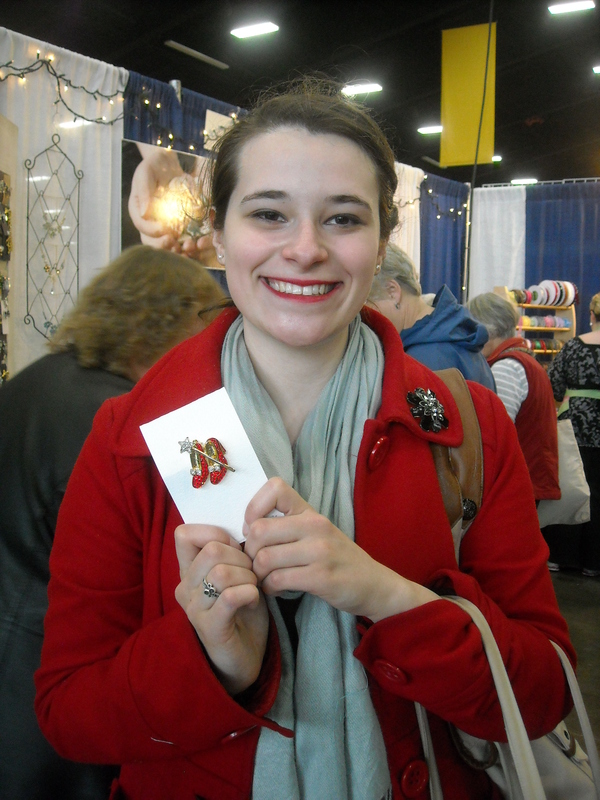 Yep, it’s a brooch of Dorothy’s red slippers from the Wizard of Oz, complete with Glenda’s magic wand!!!! Readers, I was so excited by this and I’d never seen anything like it, so of course I had to have it. 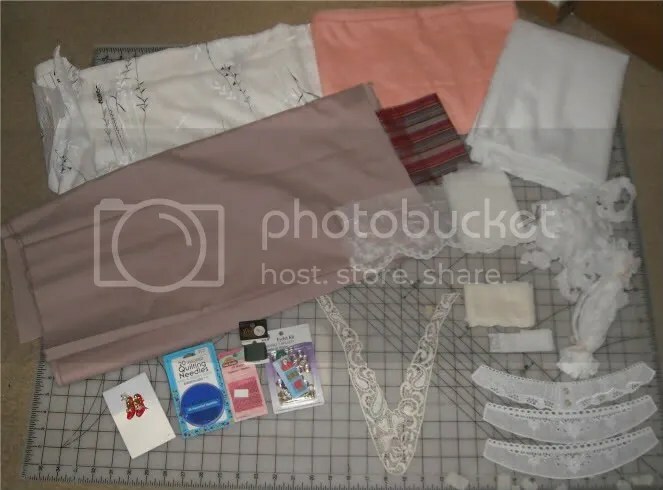 Overall, I had a pretty good haul and came away with: my Dorothy brooch, hand-sewing needles, an eyelet setting kit, lots of lace (including a cream v-neck dress for my Lady Mary dress that I’ve decided to go with for the Titanic tea), white cotton batiste for an 1850s summer dress, striped silk for the ties to finish my bonnet, peach eyelet fabric (I’m thinking either modern skirt or dress), a black and white print on a rayon fabric that feels like cotton, and a dusty pink cotton blend fabric for another modern dress. Anyways, I had a fabulous time, although for reasons that I don’t want to specify just yet (don’t want to jinx it!) this will probably be my last Sewing Expo for a while. I’ll just leave it at that and say that the whole thing was, unfortunately, a little bittersweet. what an exciting event to have been at. Good for you & your mom. I wouls love to know more about the Fine French Laces. I NEED a good lace source. 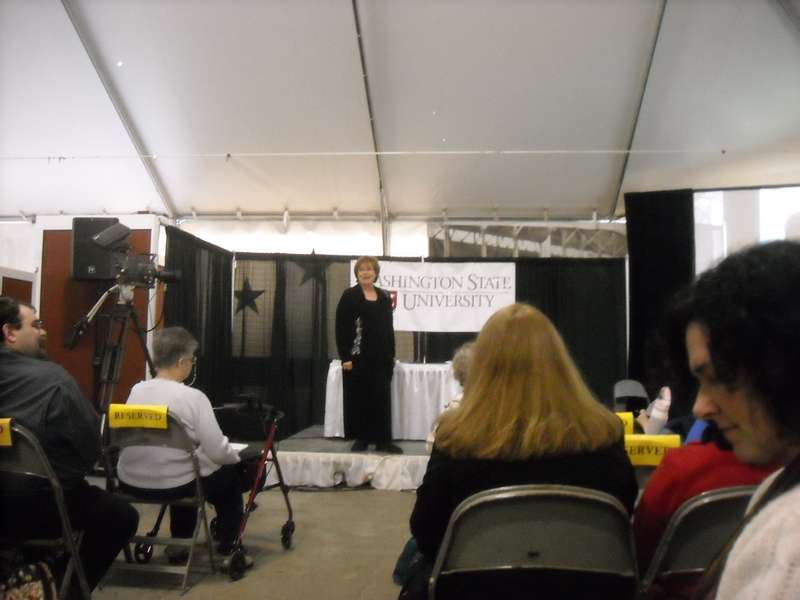 ps – it’s just not fair to dangle the ‘last sewing expo’ thing. Thanks, Nancy! It was a fabulous event and I highly recommend Fine French Laces for your lace needs. He has fabulous stuff, all 100% cotton, and I believe he still has free shipping (which is great for those of us here in the US, since his company is in the Netherlands).